Hardwood cuttings provide an easy and reliable method of propagating a range of deciduous climbers, trees and shrubs, and as bonus, they are taken from mid-autumn until late winter when more time is usually available to the gardener. Some evergreen plants, hollies for example, can also be taken at the same time of year as other hardwood cuttings. Most deciduous shrubs including: Abelia, Deutzia, Buddleja (butterfly bush), Cornus (dogwood), Forsythia, Philadelphus (mock orange) Ribes (flowering currant), Rosa (rose), and Symphoricarpos and viburnums. Many climbers can be propagated by hardwood cuttings: Vitis (vines), Lonicera (honeysuckle), Jasminum, and Parthenocissus. Fruit, including: gooseberries, black, red and white currants, fig, mulberry. Although usually restricted to deciduous plants, some evergreen cuttings can be taken at the same time as hardwood cuttings including Cotoneaster, Ilex (holly), Ligustrum (privet) and Skimmia. The best technique for taking evergreen cuttings at this time of year is that used for semi-ripe cuttings. Hardwood cutting are taken in the dormant season (mid-autumn until late winter) after leaf fall, avoiding periods of severe frost. The ideal time is just after leaf fall or just before bud-burst in spring. Although this type of cutting may be slow to develop roots and shoots, it is usually successful. The cuttings can generally be forgotten about until the following year, as the cut surface undergoes a period of callusing over the winter from which roots will develop in the spring. Hardwood cuttings are often grown on outdoors in the ground in a prepared trench. However, if you are only taking a small number, you can grow them on in containers too. Some, dogwoods for example, benefit from protection with cloches or coldframe. If outdoor conditions are unsuitable, or for slow rooting plants, bundles of 10 to 12 cuttings can be temporarily planted in a frame or pot filled with moist sand until the spring. Cornus and Laburnum are examples of hardwood cuttings which may take longer to root. In early spring, before the buds break, make a trench 12.5cm (5in) deep and set the cuttings out as described above. If you need more than one row, space them 30-40cm (1ft-16in) apart. Firm the soil around the cuttings. The following autumn the cuttings should have rooted and can be planted out or potted on as required. 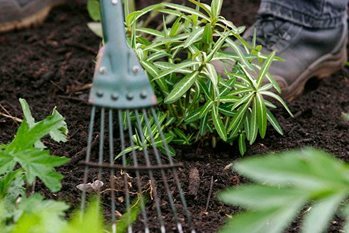 If you are only taking a few cuttings, there is no need to dig a trench as outlined above, simply insert cuttings into deep containers of gritty potting medium such as 50:50 coarse grit and multi-purpose compost. Keep the pots in a sheltered cold frame or unheated greenhouse until the following autumn, ensuring that they do not dry out. In cold winters or regions hardwood cuttings may root better with protection from a coldframe, cloches or inside a frost free building. Cuttings will need to be protected from rabbits and deer if they are a local problem. Mouse and rat control may also be needed.